Flyers right wing Wayne Simmonds the ice against the St. Louis Blues on Saturday, January 6, 2018 in Philadelphia. 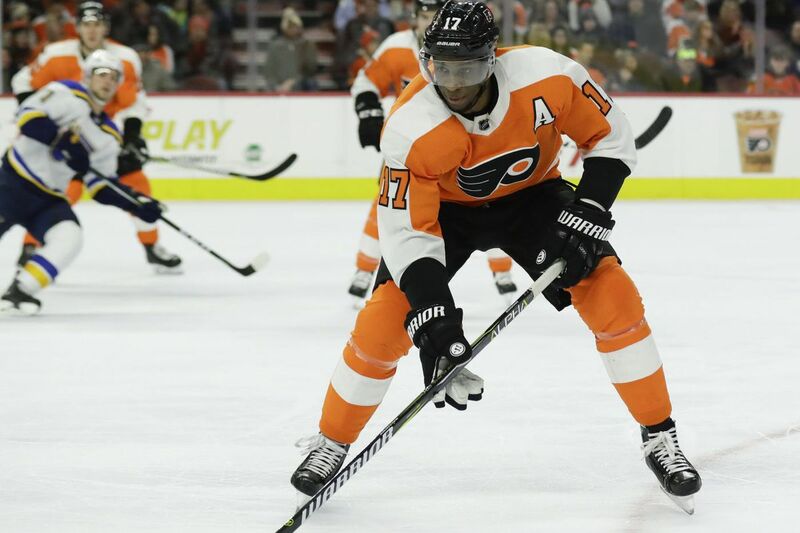 With a three-game losing streak in the immediate mirror and back-to-back games against traditional rivals on the immediate horizon, the Flyers got a performance-enhancing drug of sorts Tuesday with the return of Wayne Simmonds to the lineup. "He's a big part of our team," coach Dave Hakstol said. "He looked good. Nice to have him back in our lineup." Out since leaving a Feb. 18 game with the Rangers with what was described as an upper-body injury, Simmonds practiced on a line centered by Valtteri Filppula, with Jordan Weal on the other wing. Rookie Oskar Lindblom, who was called up from Lehigh Valley when Simmonds was sidelined, remained on the second line centered by Nolan Patrick, with Jake Voracek. "I think it's about having all four lines making sense," Hakstol said. "Having all four of the lines with chemistry. That group has played together and had a lot of success at this time last year. They played eight games together this year [in October] and because of a lot of different reasons we had to go away from it. "It's a line that can play 200 feet. Play hard. And always be a threat offensively." After a flat 4-1 loss to Carolina last Thursday, a 7-6 shootout loss at Tampa Bay on Saturday and another tepid effort in a 4-1 loss to Florida on Sunday, the Flyers begin their latest brutal cluster of games Wednesday against Pittsburgh at the Wells Fargo Center. The Penguins have beaten the Flyers in both meetings this season: 5-4 in overtime in Pittsburgh on Nov. 27, and 5-1 at the Wells Fargo Center on Jan.2. The Penguins currently sit in second place, one point ahead of the Flyers, but Pittsburgh has played one more game. A victory over their cross-state rivals would vault them over Pittsburgh and, depending on how Washington fared Tuesday night in Anaheim, potentially into a tie for first in the Metro Division. At least temporarily. Immediately following Wednesday's game here, the Flyers are scheduled to fly to Boston for a Thursday night game against the Bruins. Then it's back here for a Saturday matchup with Winnipeg and a Monday game against Vegas – two of the top three teams in the Western Conference. Make or break? Not quite. But it's a stretch for the Flyers to solidly establish themselves as legitimate Cup contenders. And a stretch that jeopardizes all the gains made in climbing from that character-building winless stretch earlier this year. "We've already been into that stretch of playing really good opponents," Hakstol said. "Tampa's as tough of a building as you're going to go into. It's about one game right now. It's that short-term focus. We're not looking for any measuring sticks or anything like that. We're looking for two points." Simmonds was also reinserted into the first power-play unit. The second power play now consists of Patrick, Lindblom, Weal, Travis Konecny, and Ivan Provorov. … Andrew MacDonald, who missed the Florida game with an undisclosed injury, said he will play against Pittsburgh. Robert Hagg was missing from practice with what was described as a maintenance day. Johnny Oduya did not practice. An update on his injury status is expected before Wednesday's game. … The Flyers were visited at practice by personnel from McGuire Air Force Base. … The Flyers announced they had signed Phantoms defenseman T.J. Brennan, from Moorestown, to a multiyear contract.